I recently had the frustrating experience of reading and responding to the blatherings of a young woman who attends what used to be called a liberal-arts college, but should now be called a left-wing indoctrination and reinforcement center. I can only liken the experience to that of attempting conversation with a parrot. The nexus of our interchange was the subject of abortion. All I need say about the young woman’s stand on the issue is that she is a scion of a “progressive” family* in a “liberal” bastion of this beleaguered republic. Having swallowed whole the leftist cant of her parents and peers, she was only able to regurgitate it. She is a living, breathing advertisement for the wisdom of forbidding a college education to anyone who has not yet worked in the real world of profit and loss. Just imagine the hoopla that would surround such a discovery if it were made on Mars. 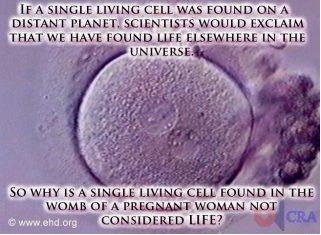 If it’s a discovery made in the womb of the next-door-neighbor, for some strange reason, it doesn’t count as life. I think at least, the real problem is when this cell (arguably living or not) becomes more important than the life and well-being of the woman it’s inside of. If this were found on another planet it would not probably exist in another being–whereas on earth, there are so many other factors to consider. Just my two cents. I do agree at least this is a thought-provoking way to present this. There is no “not” about it, the cell is living. It is, moreover, a living human being in the earliest stage of its existence. It is “viable” even then, as long as it is not aborted. “More important than the life and well-being of the woman” means what? I do not believe that “life and well-being” is a major reason for abortion. The major reason, overwhelmingly, is convenience. The brutality of abortion cannot be justified by the small number of cases in which a woman’s life and health might actually be at risk. I personally feel that it is perpetuating violence to deny women full reproductive freedoms. In that case, I also feel we do indeed have different priorities/viewpoints and this probably isn’t a very productive discussion for either of us. I should like to observe that if a woman is killed while she’s still gestating in the womb, she will never have the chance to be denied reproductive freedoms. Or put another way, women must be born to enjoy reproductive freedom. It is an irony that if reproductive freedom means abortion, then women will be denying other women their rights. Reproductive freedom is not about abortion…it’s having the freedom to do what you want with your reproductive capacities. While it is true that abortion is not the only thing a woman can do with her reproductive capacities, it’s still part of what is called “reproductive freedom.” Simply being one option among many others does not exclude it from that classification. So it remains that women who choose abortion do, in fact, deny other women their reproductive rights as well as their very lives. And that was the end of that exchange. I was drafting some comments about the young woman’s inane observations, but forbore when I saw that she had been routed and had withdrawn from the fray. And you [referring to my daughter-in-law] are correct, when a class of humanity is declared disposable [i.e., children in the womb], then no class is safe. I would argue however, in the United States, many kinds of people are already considered disposable: people of color, the less abled (mentally or physically), the elderly, the homeless, low-income, gender-queer and sexually-queer, etc. And are seen as disposable populations considering the high rate of incarceration of people of color, the refusal/ignorance of natives’ rights, the unequal access to education, the unequal access to reproductive health, the high rate of nursing homes, mental institutions, etc. “People of color, the less abled (mentally or physically), the elderly, the homeless, low-income, gender-queer and sexually-queer, etc.” have nothing to do with the morality of abortion. By introducing them, you are changing the subject from abortion, not addressing it. I personally feel that it is perpetuating violence to deny women full reproductive freedoms. “It is perpetuating violence to deny women full reproductive freedoms” is another way of saying that to ban violence against a fetus is, somehow, an act of violence. George Orwell would have called this Doublethink. [T]his probably isn’t a very productive discussion for either of us. If you find yourself in a discussion that “isn’t very productive,” you should ask yourself why that is so. Is it because your interlocutor is being illogical or ignoring facts, or is it because you find yourself unable to respond logically and factually to your interlocutor? Until you are able to carry on a discussion without committing logical errors and resorting to left-wing clichés, you are well advised to share your opinions with like-minded persons. My objections to abortion are moral and prudential. I cannot condone a brutal, life-taking practice for which the main justification is convenience. (See, for example, tables 2 through 5 of “Reasons U.S. Women Have Abortions: Qualitative and Quantitative Perspectives,” a publication of the Guttmacher Institute, a pro-abortion organization.) Prudentially, I do not want to live in a country where blameless life can be taken easily, with the encouragement of the state or at the state’s insistence. Abortion is a step down a slippery slope. The history of abortion since Roe v. Wade is a case in point: First, it was abortion in the first trimester. Then it became abortion at any time during a pregnancy, up to and including murder at birth. (Let us not dress it up in fancy language.) There have been serious (academic) proposals to allow post-natal abortion (i.e., infanticide). The next step, which has been taken in some “civilized” countries (not to mention the Third Reich and Soviet Russia) is involuntary euthanasia to “rid the populace” of those deemed unfit. Ah, but who does the “deeming”? That is always the question. Given the rate at which power is being centralized in this country, it is not unthinkable that decisions about life and death will be placed in the hands of faceless bureaucrats, accountable only to their masters in high places. And those bureaucrats will not care about a person’s politics when they render their decisions, for they will be drunk on the power that is vested in them. If anyone thinks it cannot happen here, think again. No nation or class of people is immune from the disease of power-lust. The only way to prevent it from spreading and becoming ever more malevolent is to resist it at every turn. * The young woman’s parents are “yellow dog” Democrats, and decidedly well to the left of center. For example: The young woman’s father is the “friend” I addressed in “Taxing the Rich” and “More about Taxing the Rich“; the facts I adduced in those posts had absolutely no effect on his view that the rich do not deserve their riches, and that taxing them heavily would not in fact harm the economy and therefore harm the “poor” with whom he claims solidarity. The young woman’s mother reluctantly agreed to move to the more affluent, northwestern part of Austin, so that the young woman could attend better schools; the mother was loath to associate with what she called “northwest Nazis” — a Nazi (in her perverted view) being a person who had the gall to resist and resent the dictatorial, money-wasting, redistributionist policies of Austin’s solidly Democrat ruling class. This entry was posted in Culture - Language - The Arts, Science and Understanding and tagged abortion, death panels, doublethink, left-wing orthodoxy. Bookmark the permalink.